Use the "Category", "Class", or "Educator" drop-down menus to narrow your search, or look through the list by date. Select "BOOK" next to the class of your choice and follow the steps outlined. 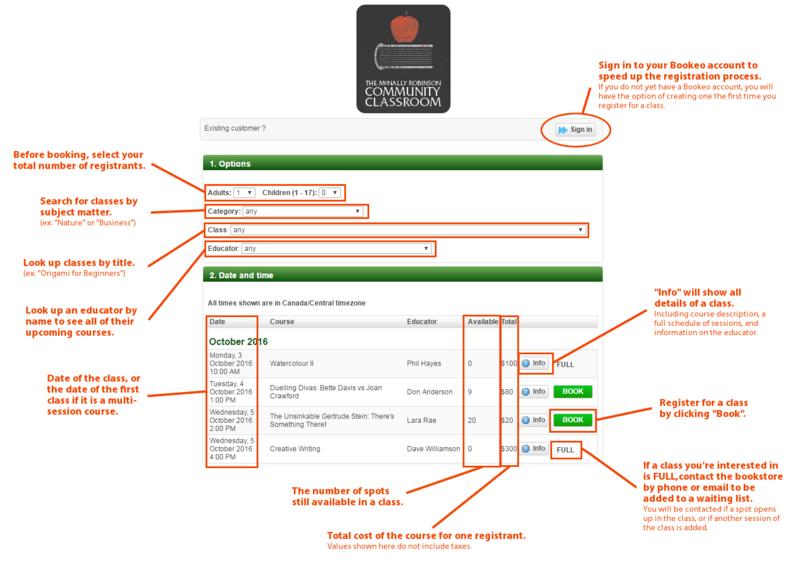 You will have the option of adding more classes to your checkout once you have started the booking process. You may also register for any of the classes in person, over the phone, or by mail: visit this page for more details. Please select the total number of registrants in "Options" (under the "Adult" or "Children" drop-down menus) before clicking "BOOK". NEW TO OUR ONLINE BOOKING SYSTEM? We recommend you look over this visual guide before you get started. Please note: If you are trying to log-in to your existing Bookeo account but cannot remember your password, please use the "I forgot my password!" option to reset it. If you continue to have trouble, please contact us. If the class list does not load in this space, it is likely because your browser is out of date or does not allow scripts to be run. Please update or adjust your browser settings, or use a different browser. If the issue persists, please contact us.